2 pieces of my work were selected for Pinpoint 13 which is an exhibition of contemporary miniature works that express a sustained conversation with materials. 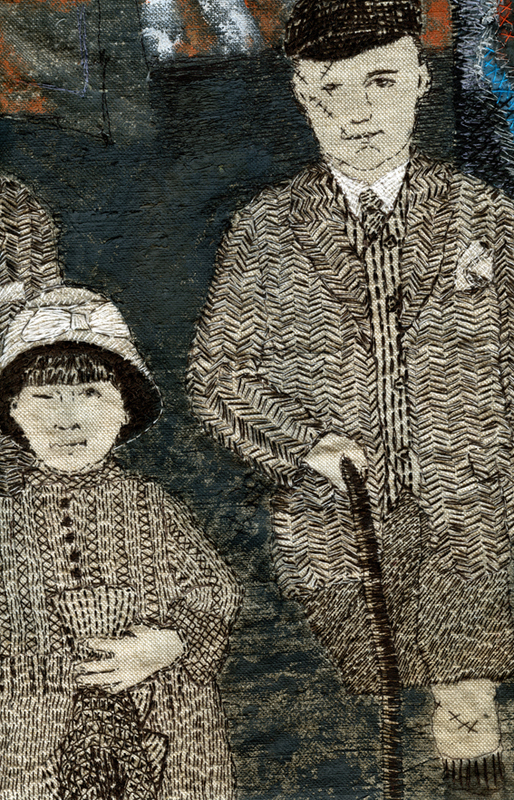 The selecting panel included leading figures within the textile art world, Polly Binns and Linda Brassington, who worked in collaboration with the Directors of One Church Street Gallery. The panel reviewed submissions from hundreds of applicants from around the world, seeking a breadth of approach in the construction or application of cloth and thread. Submissions came from an international arena including Israel, Finland, United States as well as the United Kingdom. The exhibition runs until 9 November 2013 at One Church St Gallery, Great Missenden, Bucks, UK and also features work by my fellow members of the 62 Group of Textile Artists Ann Goddard and Jan Miller. More information about these works. 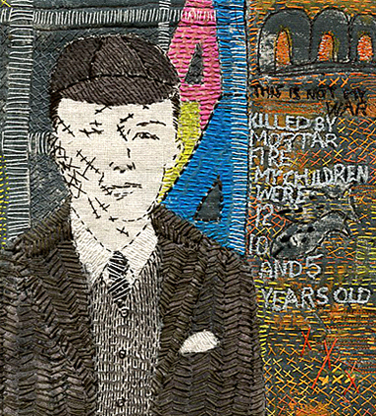 This entry was posted in Art Galleries, Embroidery, exhibitions, one church st gallery, Sewing and Stitching, Textile Art and tagged 62 group of textile artists, ann goddard, embroidery, exhibitions, hand embroidery, jan miller, Machine stitch, mixed media, one church st gallery, paint, sue stone, textile artist, textiles on October 25, 2013 by womanwithafish. My mini textile: ‘Study for Some Things Never Change’ (below) has been selected for the 9th Baltic Mini Textile Trienniel at the Museum of Gydnia, Poland . Exhibition runs from 28 June to 1 September 2013. The piece was hand and machine embroidered onto a recycled cotton Damask tablecloth. 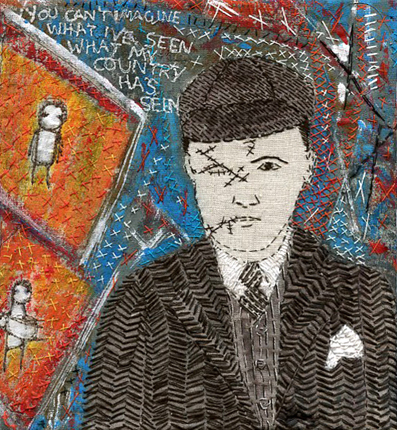 This entry was posted in Art Galleries, Embroidery, exhibitions, Textile Art and tagged 9th Baltic minitextile trienniel, embroidery, exhibitions, Gydnia, hand embroidery, Machine stitch, paint, Poland, sue stone, textile artist, textiles on June 12, 2013 by womanwithafish. 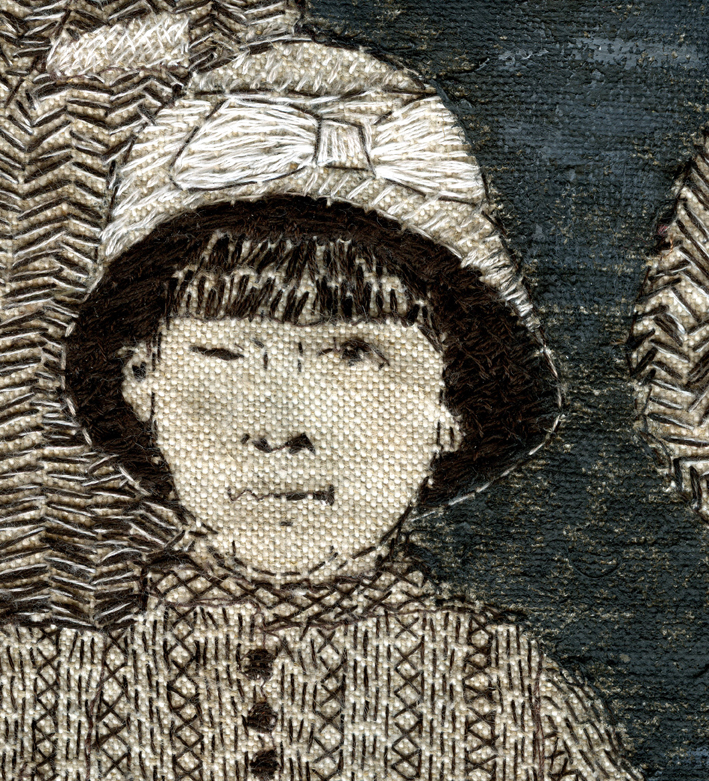 The latest 62 Group of Textile Artists’ exhibition opens today at the Constance Howard Gallery which is housed in the old Deptford Town Hall building on New Cross Road, London, SE14. The 62 Group has a strong link with Goldsmiths as many of the exhibiting members were past students and indeed teachers. “Small Talk”, as the title suggests, brings together new small-scale work in a range of mediums in response to the gallery space. This entry was posted in 62 group of textile artists, Embroidery, exhibitions, Textile Art and tagged 62 group of textile artists, 62group, arts, Constance Howard, Deptford town hall, embroidery, exhibitions, Goldsmiths college, Grimsby, hand embroidery, london, Machine stitch, paint, stitch, sue stone, textile artist, textiles on June 4, 2013 by womanwithafish. In the early morning listening to Radio 4 the news all seems to be bad. My most recent piece is called Some things never change. The need to make this work was triggered by an interview with a mother telling the reporter of the fate of her children aged 12,10 and 5 , killed by mortar fire in a war that was not hers. As a mother myself the interview deeply affected me. I have never been a particularly political person but I feel the need to speak out, in my own way, about the victims of these senseless conflicts. Born in 1913 my Dad was a child of the 1st World war, the so called the war to end war and I have used his image, along that of his siblings, as a mechanism to portray the plight of children still caught up in war in 2012. Thousands of kisses cover a concrete pillar for those who will never receive them. The images are of the work in progress. 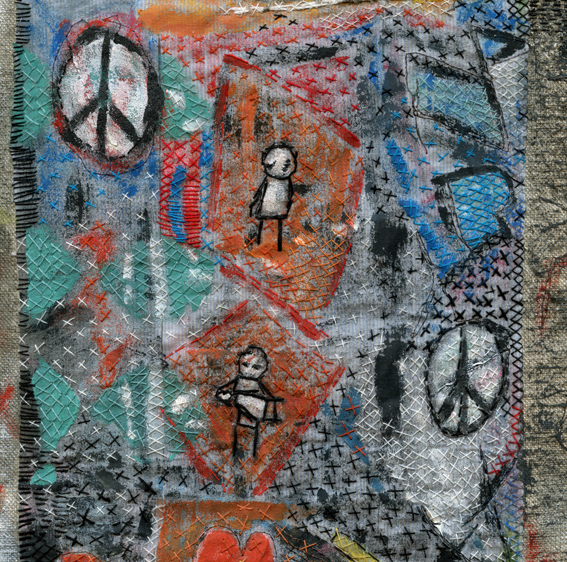 This entry was posted in 62 group of textile artists, Embroidery, Textile Art and tagged 1st world war, children, grafitti, london, mother, paint, radio 4, stikman, stitch, Stitch • Paint • in Progress, sue stone, textiles, war on August 8, 2012 by womanwithafish.